After a while playing golf on the Town Moor became a problem, due mainly to unrestricted public access and to damage caused by animals. It was therefore decided that a new site would be sought and in 1907 land was leased from a Mrs Bainbridge of Grange Farm, Three Mile Bridge, Gosforth. The Town Moor Course and the clubhouse on Claremont Road were then handed over to the Newcastle United Workmen's Club, whose members had also been using the Town Moor Course. 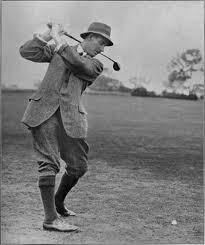 Harry Vardon was engaged to design the new course and in the following year, 1908, he played a challenge match against James Braid over his new layout. The course length then was 6068 yards with a par score, or in those days bogey sccore of 82. During the inaugural match on the new course a very strange thing happened. While playing the very first shot on the first hole, the then Secretary, Mr. James Potts, hit a crow with his ball and killed it. The actual bird was stuffed and remains on display in a glass case in the clubhouse. In 1962 part of the course bounded by Broadway West was purchased by Northumberland County Council to make playing fields and to build a school. New land was provided to the west and nine new holes were constructed. At the same time Gosforth Urban District Council became the Club's landlord with the lease being for a maximum term of 52 years. In 1974, due to changes in, and reorganisation of local government, Newcastle City Council, the successor to Gosforth UDC, became the Club's landlords.